1. How many members do you accept? 2. What piece of equipment will I audition on? Flag only. If you have rifle or sabre experience, please indicate years experience on application. 3. Do you provide our equipment for auditions? Yes. We supply each student with a 6ft pole and flag. We recommend you bring water. 4. Do you need to have dance experience? You will be asked to demonstrate basic movement skills during the audition. 5. How difficult is it to join? Previous flag experience is imperative for membership in the colorguard. This includes the following advanced skills: drop spins, peggy spins, cones, tosses from both the silk and pole, and basic movement under the equipment. You will learn an “On the Spot” routine during auditions, which will include all the fundamentals on flag. 6. What should I wear to the audition? Generally, form-fitting clothes tend to be less obtrusive when spinning equipment. Anything you can thoroughly move around in will be the most comfortable. 7. If you are unable to attend the audition, will a videotape suffice? 8. Is there a band camp? Yes. Band camp is mandatory. All required dates/events and football games are on the guard and marching band website. Check back often for updates. 9. What is your practice schedule? 10. What is the course title and how many credits do I register for? The course title is Marching Band (MUSC 123), and it is offered only in the fall and is worth one credit hour. It is mandatory to be enrolled in this class to participate in the Marching Band. An override form can be obtained from the band office if the course goes over 18 credit hours on your schedule, and the band does offer compensation in the form of a stipend for such reasons. 11. How many performances do the band and guard participate in? We have approximately ten performances in the fall. This would include seven homes football games, two away football games, and an outside appearance. However, this varies from year to year. You will get a list of times at the beginning of band camp. 12. Do you have a winterguard program? Unfortunately, USC does not have a winterguard program. However, we are hoping to take a serious step in this direction soon. 13. How much does it cost to be in the fall colorguard? You are responsible for paying for the class, plus any personal items you wear: shoes, t-shirt, gloves, hair products, make-up. We are trying to get bookbags and warmups for this fall season but we hope to raise funds to offset the cost of these items. They usually will not exceed $150.00 dollars. The University supplies the uniform. 14. Does the University supply my Equipment? The university will supply you with all of your equipment. 15. Where does the band practice? At the new band building on Sumter St. 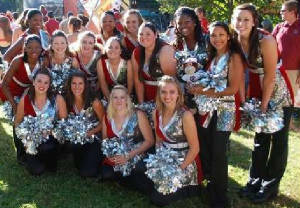 The 2010 guard during ESPN Gameday!